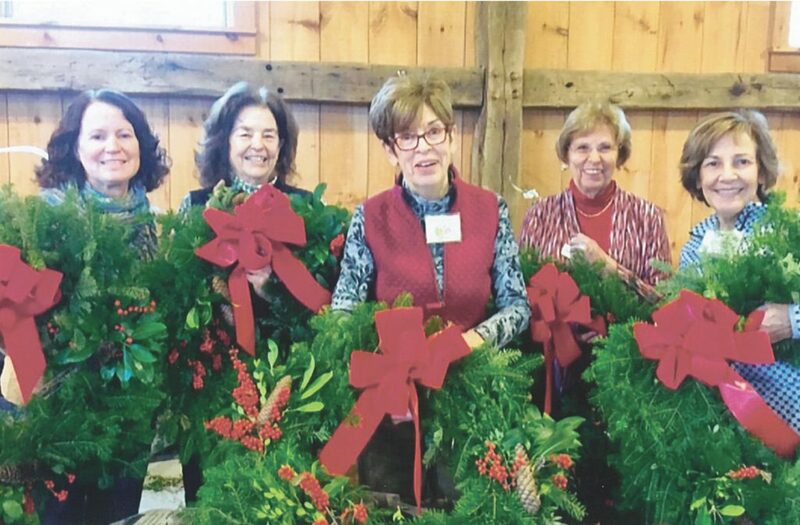 Courtesy photo The holidays are more colorful in Hollis thanks to Hollis garden club members, from left, Debi Davis; Martha Smith, first vice president; Priscilla Levasseur; Ada Allen; and Patti Tures, seen here making wreaths at the Lawrence Barn, the site of the club’s monthly meetings. Members of the Colonial Garden Club of Hollis, since its founding in 1966, have in fine fashion fulfilled the intent of the founders. They have shared for more than half a century the joy that is the sweet smell of elderly compost, the tactile velvet of a fuzzy donkey ear and the awe at watching a seedling erupt from the earth on a single blanched leg and lift its double-brained noggin to the sun. The determination of more than 60 women and men of Hollis and elsewhere to help preserve the natural beauty of the town incorporated in 1746 is a mission fully embraced. Plantings abound in locations including Monument Square whose perimeter, the town center village, is listed on the National Register of Historic Places. Club members headed by Kathie Nannicelli, president, also beautify the property at the Always Ready Engine House, the Hollis Social Library, Hollis Town Hall and more. The club maintains the gardens at Wheeler House, bequeathed to the Hollis Historical Society as a permanent home for its collections. The club supports a scholarship fund for local students and projects for scouts pursuing Eagle status. It assists Beaver Brook Association, a Hollis nonprofit dedicated to land stewardship and conservation education. In addition, most of the 60 participants nurture home gardens showcasing flowers and vegetables that surely would rate magazine covers. 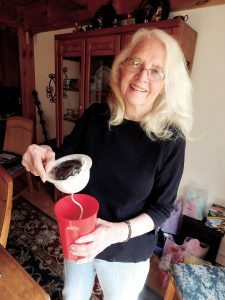 Anita Walker, of Hollis, a longtime member of the Colonial Garden Club of Hollis, also is a publicity person for the New Hampshire Orchid Society. She noted recently that many club members are orchid aficionados and most rarely miss a NHOS orchid show and sale. The 28th Annual International Show and Sale, a floral extravaganza of hundreds of brilliantly patterned varieties of orchids, is scheduled for Friday, Saturday and Sunday, Feb. 8-10, at the Courtyard Marriott, 2200 Southwood Drive, in Nashua. Newcomers to the Colonial Garden Club of Hollis are welcome. The club hosts convivial meetings that frequently feature guest speakers, notes Priscilla Levasseur, membership secretary. Meetings take place at 9 a.m., on the first Tuesday of the month, October-May, at the Lawrence Barn, on Depot Street. A annual plant sale, the club’s regionally renowned yearly fundraiser, will be held this year on the Hollis Town Common, 9 a.m. to 12 p.m., on Saturday, May 11, during Mother’s Day Weekend. More information about the nonprofit club can be had online: hollisgardenclub.org.